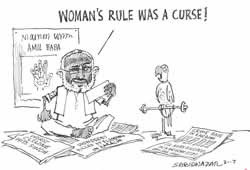 Sir: This is with reference to Sindh Chief Minister Dr. Arbab Ghulam Rahim’s remarks about woman’s rule being a curse, in a public meeting on August 26, 2007 at Thatta. What he said is undeniably revolting, but you have to understand that the members of the religious organisation he associates with are not the kind of people who can bear to see a woman exercising authority over men. Moreover, coming from a feudal background, he has grown up to believe that the only thing women are good for is giving birth to children and serving their males. Landlords like him have absolute power over the women working on their lands. How can one expect such a man to be moderate and tolerant?